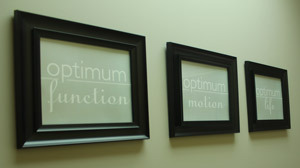 Welcome to Cordick Chiropractic & Optimum Health Clinic. Where our patients goals, are our goals. At Cordick Chiropractic & Optimum Health Clinic we make a point of taking time to listen to each patient, understanding their unique problems, so that we know exactly where they are now and where they have come from with their concerns. Working backward to find out how things have evolved helps us to identify areas where patients can prevent relapse and future injury. Approachable and open, we want to help each patient understand their options and allow them to make choices for their care. Your condition may require rehabilitative exercises, or addressing historical and habitual issues that have led to problems. We’ll invite you to be involved in your care as much as you desire. As we work in a problem-solving manner to find the root cause of your complaint and investigate to establish a plan for your wellness goals, we try to be very direct so that you understand what to expect regarding timelines and results. We’re committed to evolving our techniques and the way we address each case as you heal. It’s our desire to see you regain your independence so you can get back to enjoying the activities you love. As we are committed to providing you with the best possible care, we will help you find the right care when your needs are beyond our own resources. We do this by maintaining a diverse network of health professionals with whom we work with. We want to be a complete resource for health for each of our patients. From time to time we’ll host guest lectures on topics that may interest you. Keep your eyes open in the office and here on our website for details. In-house ergonomic consultations, health and safety consultations within the workplace and at fitness facilities are also available. If you’re seeking relief or wellness, call (613) 267-6646 today!